Tag Archive | "maple cream"
A “sugar stove” used by the LeSages to boil down maple sap. There’s an old saying that goes, “From tiny acorns grow mighty oaks.” In this case, it was maple trees and the seed that was planted was that of inspiration. 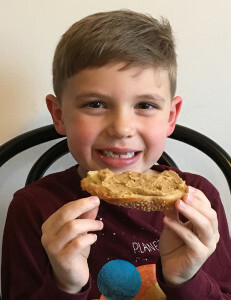 Last March, Christian LeSage, a Michigan Department of Natural Resources fisheries biologist, and his family went to Fenner Nature Center in Lansing for its annual Maple Syrup Festival. 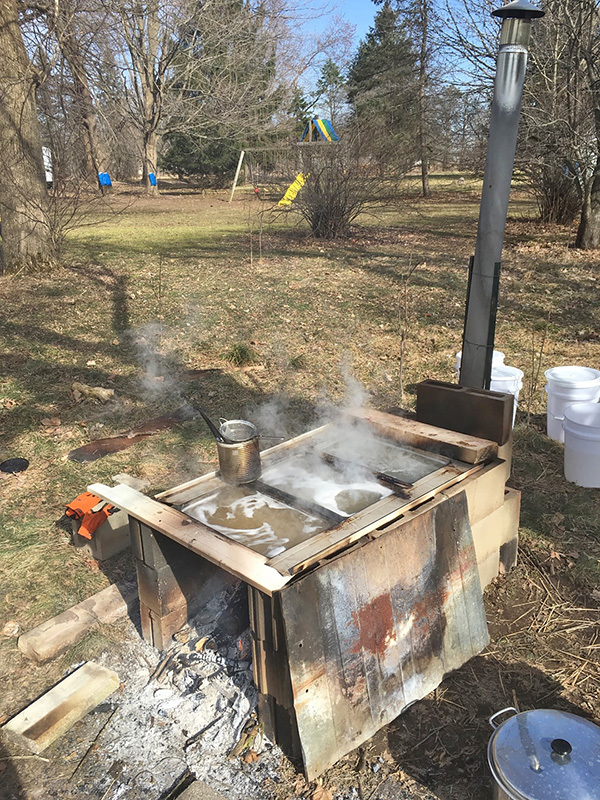 That glimpse into how sap is turned into treats like syrup and maple cream sparked an interest in starting his own sugar bush at home in Holt, where LeSage has 1.5 acres and seven nice maple trees. He bought a book about maple sugaring and $30 worth of gear from the local store that sells sugar-bush supplies, and his syrup-making endeavor was off the ground. “Last year we tapped five trees and got 40 gallons of sap in one week, which boiled down to almost a gallon of syrup,” LeSage said. LeSage has since learned that his trees are big enough to tap multiple times. “I thought we could double production this year by placing two bags for sap collection on each tree,” he said. In one week’s collection time, the seven trees he’s tapped yielded 85 gallons of sap. Gather: Leona and Silas LeSage out on a maple sap gathering outing. The process of making maple syrup usually begins months before spiles (taps) are knocked into tree trunks in February or March. The first steps are to identify trees for tapping and collecting supplies. Next comes the actual tree tapping, followed by boiling of the sap to kill bacteria and evaporate excess water, which turns the sap into syrup. Last year, LeSage did some Internet research and figured out how to create a wood-powered outdoor “oven,” using cement blocks, to boil down the sap. 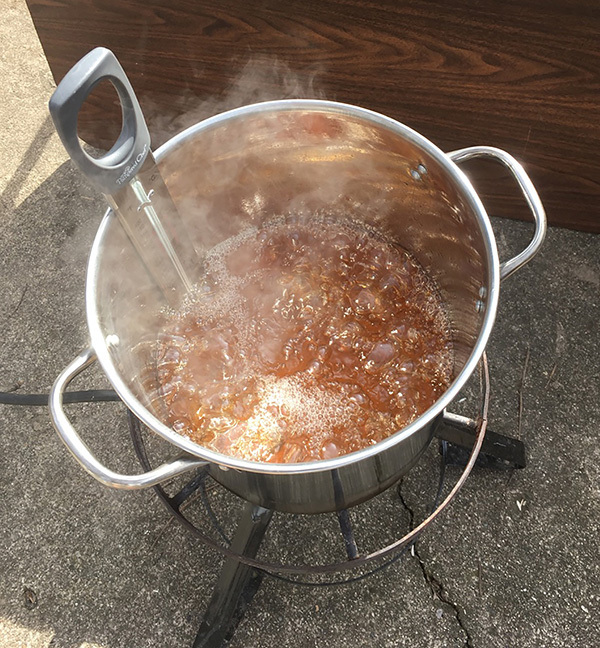 This year, he made the stove 30 percent larger and is now running three steam trays, versus two last year, to aid in reducing the sap boiling time. While he enjoys his family’s new hobby, LeSage admits that it can be labor-intensive. 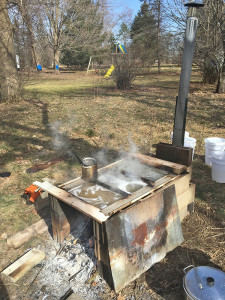 Boiling maple sap nearing the finishing point. 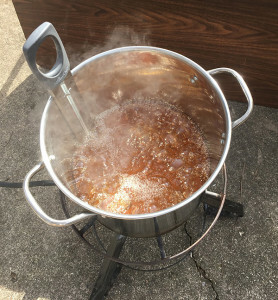 It’s a process that requires constant sieving—so that the sap that burns when it bubbles up doesn’t end up giving the syrup a bad flavor—and stoking the stove with wood. “My lower back was screaming at the end of that day,” LeSage said. One tricky part about making syrup is determining at which point in the boiling process it is finished. “My wife, Sarah, has that tough job. When do you have syrup? If you go too far, it crystalizes. Barometric pressure and elevation factor in too,” he said. But LeSage’s nose helps tip him off when it’s close to syrup stage. “It smells like cotton candy when it’s almost done,” he said. Finding the right window of time for tapping trees can be complicated too. “It’s a race against time,” LeSage said. “Since the temperature has to be above freezing for sap to flow but sap gets bitter when the trees start to bud. The syrup-making hobby has become a special family affair, with Sarah, the kids and in-laws helping. Sarah works as the aquatic invasive species coordinator for the Michigan Department of Environmental Quality. “It’s fun to get in touch with one of the first signs of spring that’s happening right outside our backdoor,” she said. The LeSage kids get a kick out of being involved too. Silas LeSage demonstrates one way to eat maple cream. “My son talked about it in his kindergarten class when they were learning about trees,” he said. Besides syrup, the family has tried making maple cream, a thick confection also known as maple butter or maple spread. “My kids each ate a jar of that in about two days,” LeSage said. “It’s a specialty product you won’t find in grocery stores and is delicious spread on just about anything,” she said. The family makes the syrup mostly for their own consumption. As the weekday breakfast-maker, LeSage uses a lot of it on waffles and pancakes. What he doesn’t use, he gives away. “It’s neat because you did it in your own backyard,” he said. Interested in getting an up-close look at maple sugaring? 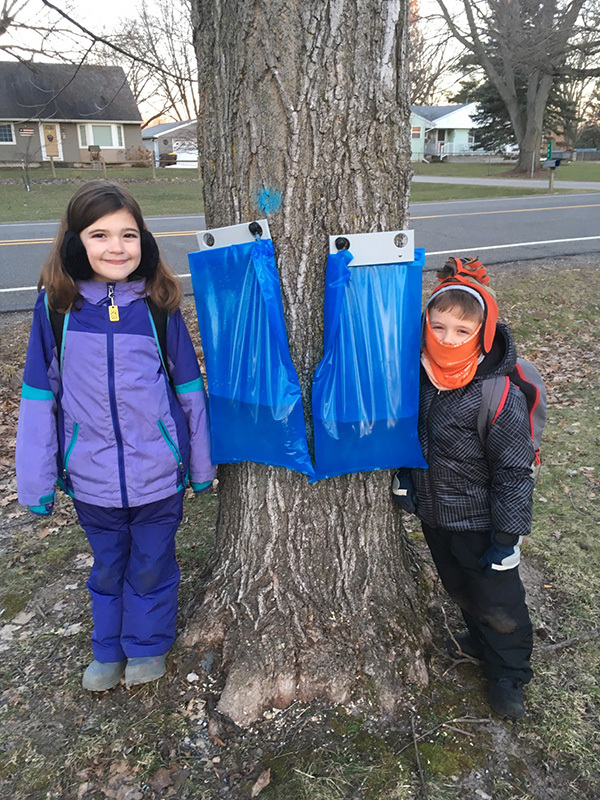 Check out Maple Syrup Day at Hartwick Pines Logging Museum in Grayling on Saturday, April 1—with tree-tapping demonstrations, information on how to start your own sugar bush and kids’ activities—or visit one of the other local maple syrup festivals around the state. Find out more about making maple treats from maple trees at several online websites, including www.tapmytrees.com.